Four South Korean workers died at a construction site for a landmark apartment complex in Busan on Friday after a temporary structure carrying three of them plunged. 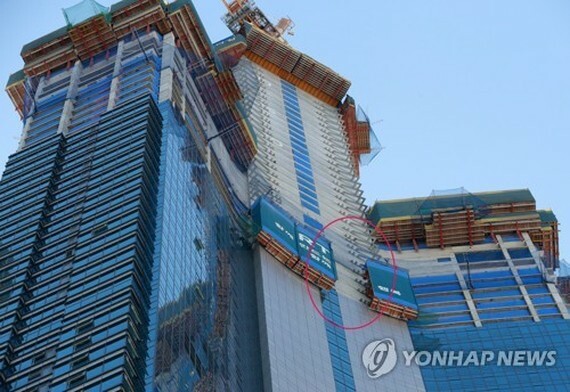 The three construction workers were working on the exterior of an 85-story apartment building when scaffolding supporting the workers fell to the ground at 1:50 p.m., according to firefighting authorities and POSCO E&C, the builder of the complex. The structure fell from the 55th floor, some 200 meters above the ground. One more worker was killed after being hit by the plunging structure while he was doing concrete work. The apartment building is part of the LCT high-rise apartment complex under construction along a popular beach in Busan. It is comprised of a 101-story tower and two 85-story residence buildings. It was one of many temporary structures installed along the outside of the apartment as workers were working on the exterior of the high-rise building. But no safety facilities were in place for a potential collapse of the structures. All construction work was put on hold at the site as the police and the firefighting authorities opened an investigation into the cause of the accident. The National Forensic Service plans to conduct an on-site investigation on Saturday, according to officials. POSCO E&C issued an apology, saying it "deeply feels a sense of responsibility for the accident and extends sincere, heartfelt condolences and apologies for the workers and their bereaved families." The luxury complex had previously been embroiled in a political scandal, with Lee Young-bok, who masterminded the construction project, convicted of bribing politicians and government officials in return for business favors. Source from the Yonhap News Agency.